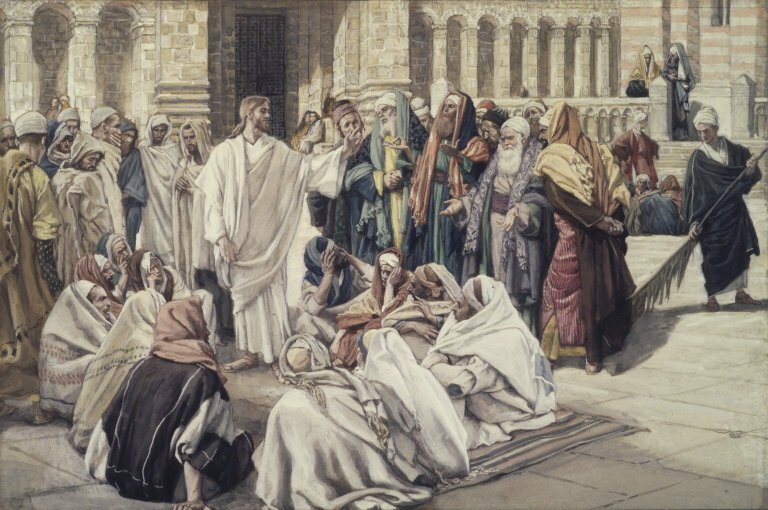 He spoke harsh words to the Jewish religious leaders known as the Pharisees (FAIR uh seez). These men were very careful to tithe, or give one-tenth of all their income as an offering to God, but sometimes they would call attention to themselves so that people could watch them put their money in the collection. They were very proud of the fact that they were observing the law of Moses, but they were uncaring. Jesus compared them to tombs that had been painted with whitewash and looked very beautiful on the outside, but in reality they were like graves full of dead men's bones, not beautiful at all. These men would even kill the prophets that God had sent, if they didn't want to hear the message they brought. When John the Baptist came preaching and telling them to repent, they did not listen to him and they refused to be baptized. The Scribes were a part of the Pharisee group. They copied the law by hand, and they were regarded as important because they interpreted it and told the people the meaning of the Jewish law. They were very proud of themselves and wore long robes with broad borders, or fringes on them to show their importance. They wanted to get the best seats in the synagogues, the places of worship. They loved for people to call them "Rabbi", or teacher, and they would pray long prayers out in public just for people to see them. 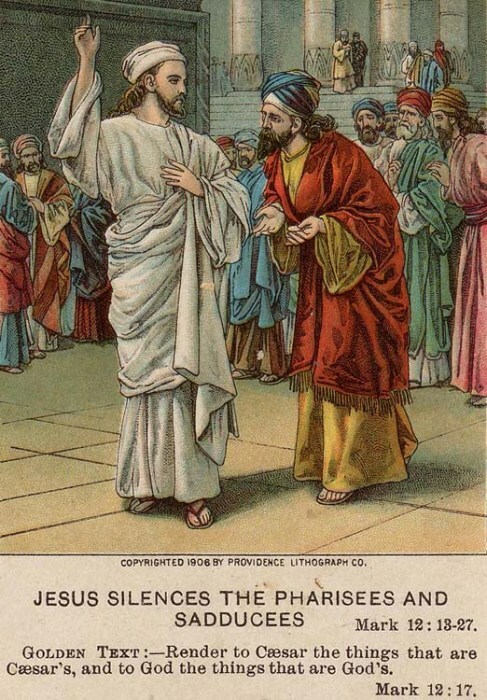 The common people looked up to the Pharisees and regarded them as very religious. Now it was not a bad thing to be a Pharisee. It was a good thing. Jesus was condemning these Pharisees because of their "hypocrisy" (hih POK ruh sih). They preached the truth, but in their lives, they just pretended to obey God's law. They really did not respect or care about others. We call such people "hypocrites" (HIP uh krits). The Sadducees (SAJ uh seez) were Jewish religious leaders who were from the wealthy families. This group did not believe that people would be resurrected, or raised from the dead. They also did not believe angels existed. Memory Peg: To not believe in the resurrection or in angels could make them "sad, you see" (Sadducee). There was a Jewish ruling council called the Sanhedrin (SAN he drin). It was composed of a group of 71 men* who were Pharisees and Sadducees. Not all the religious leaders were proud and conceited. You may be familiar with three good Pharisees who were prominent in Bible times; Paul the apostle, Nicodemus, and Gamaliel (guh MAY lee uhl), a wise man on the council. * According to some sources there were 70 men and the high priest presided over the council. 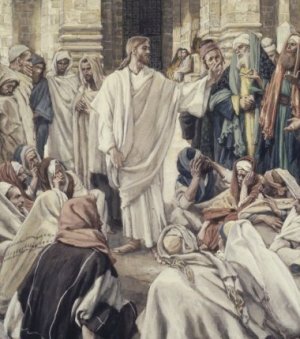 What was wrong with the Pharisees? Did they care about others? Jesus said they looked like good people, but really they were wicked inside. They thought they could please God just by obeying a lot of rules. Obeying rules is good. We have rules at home and rules at school, and these are necessary to make our lives run smoothly. But you cannot get to heaven by obeying rules. Jesus said the most important thing is LOVE. The first commandment is to love God, and the second is to love others. If you love God and love others, you will always do the right thing, no exceptions. Make this your goal to love God first and put others before yourself. English Bible Activities Select story #213 in the list for activities to accompany this Bible story. Spanish Bible Activities Select story #213 in the list for activities to accompany this Bible story. Press "Go" to search for books about Jesus. Very interesting. Would have been interesting however if you could have included more on Herod and other Edomites like him. Herod was an Edomite (Idumean) and not a Jew, but was known as king of the Jews and appointed by the Romans as a puppet king (not of the line of King David). He was a mass murder - even of his own family members and appointed other Edomite convert Jews (impostors) into the priesthood of the Pharisees. The Edomites were a branch of the Canaanites who were the enemies of Israel and at war with them for hundreds of years before Christ. The Maccabee Jews made a grave mistake by converting them to be Jews. They were the leaven (impurity) of the Pharisees, maybe less so amongst the Sadducees who were also corrupt to an extent. The Edomite Jews actually crucified Christ and Christ said they WERE, AND were NOT of Abraham -- which was true. They were Canaanites, but were also of Abraham, like the Israelites, except through Esau (Edom) and not Jacob (Israel) like the Israelites. They actually crucified Christ (the chief priests - Sadducee Edomites) after Roman Pilate washed his hands of the matter. The Edomites that Herod helped to power were amongst the Sadducees and the Pharisees, although the Sadducees were closer to the truth in many ways, but not all ways. After they killed Christ their divine judgement that Christ warned them of came - the Roman massacres - but not before the Zealots (Pharisee Edomite Jews who were the most "zealous") and Edomites (masses) joined forces in massacring the Sadducees and masses of common, average true Jews in Jerusalem (not that Edomites didn't form part of the Sadducees). After killing Christ the Edomite Jews wanted to kill every true Jews who was not an Edomite Jew. One thousand years later the Khazars (Mongolian hordes leftovers + Eastern European mix) were converted to Talmudic (non-Moses) Judaism by these Edomite Jewish Rabbi's AND THE MODERN JEWS ARE THEIR DESCENDANTS TODAY. This page displayed 129,916 times.